Thomas Nearney, a first-year Law student at St Mary’s College, has made political history by becoming the youngest ever member elected to Durham County Council. Mr Nearney, who was elected by the narrow margin of 42 votes as a Labour councillor for Annfield Plain, said that he was ‘ecstatic’ about the result. ‘Councillor Michele Hodgson and I were fighting a seat which was half Labour, half Derwentside Independent, so it was not a safe Labour seat as some might think,’ he said. He attributed their electoral success to a strong campaign on the right messages. ‘We fought a long campaign on local issues, where we listened and acted upon people’s concerns. Our campaign was very positive, which I think helped provide solid foundations on which to build. ‘We set priorities around the quality of the local environment, housing and community engagement; and that is what we will now be acting upon in power. 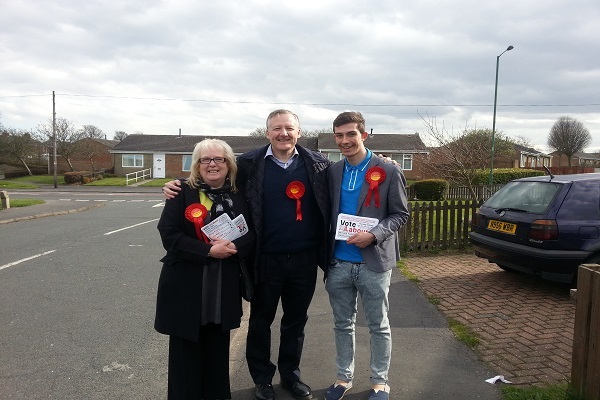 Councillor Nearney joined the Labour Party four years ago when he was a student at St Bede’s School in Lanchester. Since coming to Durham he’s been balancing his degree with election campaigning and a part-time job, a heavy workload that he says will prepare him for the role of councillor. ‘By losing my part time job I will able to concentrate my efforts in Annfield Plain, especially as I will be living at home in my second year. He said that he would work hard for local residents and listen to their concerns. Councillor Nearney also said that he was ‘exceptionally proud of the local Labour party’ for the gains they had made in last Thursday’s elections, thanking their members and families for the support they had given him since campaigning began in November. Labour won a landslide 94 out of the 126 seats available on Durham County Council in last Thursday’s local elections, increasing their majority to a comfortable 62. It was a bad night for the Conservatives and the Liberal Democrats as they lost seven and sixteen councillors respectively. It was also a disappointing night for the Green Party who failed to secure any seats. 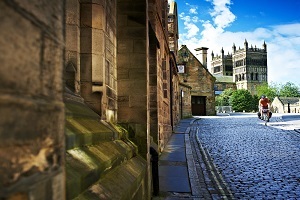 But the Liberal Democrats held on in the student areas of Durham City, winning in Elvet and Gilesgate, Neville’s Cross and picking up Durham South from Labour. Nigel Martin, a former Principal of Trevelyan College, and Grenville Holland, a former President of the Durham University Cricket Club, were re-elected in Neville’s Cross promising to prioritise green issues and housing when representing students in County Hall. Mr Martin said: “We have been lobbying hard to introduce mandatory Houses in Multiple Occupation(HMO) licensing for all properties. David Freeman and Richard Ormerod were elected for the Lib Dems in Elvet and Gilesgate whilst David Stoker won a tight four-way marginal in Durham South. Joe Donnelly, the President of the Durham University Liberal Democracts, said he was pleased with the results in Durham City. He said: “We won the student vote in the Hill Colleges but it was close. We got around 30% whilst the Tories, Greens and Labour were around 20-26%. “We also won the polling station in the Elvet and Gilesgate ward that covers the Bailey students but there was very low student turnout. Across the county it was a difficult night once you left Durham City but that was always going to happen in former mining areas once we went into coalition. Nine students from the Durham University Conservative Association (DUCA) were standing as candidates in the election and they won 1,477 votes overall. Their best performance came in Durham South where DUCA’s Political Officer, Jonathan Duell, achieved 3rd place with 15% of the vote. Mr Duell said: “In challenging political times the DUCA team has been delighted by the enthusiastic contributions to many hard-fought campaigns by a large number of our dedicated members. “The positive responses we received from students and local residents alike emphasised the benefits of engaging with real political issues on the doorsteps of County Durham.